From the Wirral, on Merseyside, Stuart G Yates brings to his work the gritty atmosphere of a region and life which were tough, varied and always exciting. He has written from an early age, in fact there were many times when the only way he get through was by bashing out words on his old Olivetti typewriter. Now, he does the same but on a keyboard. 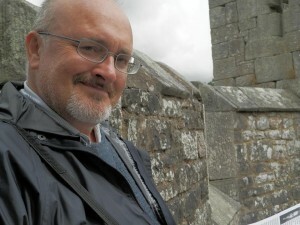 He writes thrillers and historical fiction and has also been known to dabble in the paranormal. He enjoys reading, painting houses (that’s the artistic type!) and would love to live in France, a secluded cottage in the Lakes, or a narrow boat in Shropshire. He doesn’t mind which, as long as his dog is with him and there is a good internet connection. A lot of things. I enjoy writing, never see it as daunting, and am forever conjuring up stories. Ideas spring from anywhere and everywhere, but rural landscapes feature large and music is certainly one of my great starting points. I love atmospheric, instrumental music, be it classical or new-wave. I love John Taverner, Arvo Part, Tangerine Dream and Sigur Ros. I’ve just discovered some beautiful Icelandic sounds, which really help when I’m writing about Hardrada. I become lost in memories of the places I have visited or lived, the wonderful people I have met. I am a dreamer, always have been, escaping reality through my imagination. Life can be grim, but in my mind, the endings are almost always happy … well, up to a point! When an idea arrives in my head, and I like it, I often sketch out the opening. These first few lines, for me, are crucial. They set the atmosphere and pace of the book right from the word go. I often will develop this into the opening chapter, whilst constantly thinking of new scenes, characters, etc. I think this is the key. You have to ‘see’ your story unfolding before your eyes. I never worry about spelling or structure in this first draft, all I’m really interested in is getting the story down. I work fast, writing around 3000 words a day (I can only write at weekends as I work, as a history teacher, and I come home shattered in the evenings. During the holidays is my most productive time, of course). At some stage, and I never know when, I map out the storyline. I do not have a hard and fast rule about this, but usually about half way through, I look at my disparate notes and ideas and develop them, moving everything towards the end, which I know from almost the very beginning of the process. I tend to allow my characters to develop through their actions and their dialogue, rather than giving the reader detailed descriptions of them. I want the reader to bring their own imagination to the story, and I hate inhibiting them too much. I see the entire story as a film, and have learned how to develop stories through a life time love of films, especially westerns. You can learn a great deal about pace and development from films, most notably the truly great ones. I honestly believe the best way to learn how to write is by writing and reading. Reading is the single most important thing you can do. It develops everything. I suppose that is the teacher in me, but if we do not read we are not allowing our imagination to develop. So, even when I was watching films, I was reading. It is still one of my great loves, but I’m very particular now with what I read. I love bookshops, and they are a great inspiration for me. After the first draft, I often read aloud the dialogue, adding and improving it as I go along. I acted for a few years on Merseyside, and this certainly helps me. I was a very intuitive actor, with an ability to enter into a character’s psyche. I still do that, with the characters I write about. I don’t sit and develop them, I allow them to develop for themselves. Often they are taken from people I have known, but they are never one particular person. I love my heroes, who are almost always brittle, confused personalities who are struggling to find themselves. The bad guys are almost always far more single-minded and confident and i love it when my poor, down-trodden protagonist gets the better of them in the end! That buzz that develops from the very pit of your stomach as a story arrives from somewhere, never ignore it. Sit down and write. Have a notebook in your pocket, or by the side of your bed, or, if you’re a technophile, put it down on your smart-phone. And do not stop. If you want to write seriously, you must have more than one book in your head. As one is finished and you’ve submitted it to agents or publishers, you work on the next one. It is a constant process. I’ve never understood how writers can have a ‘break’ from writing. I don’t. I am forever thinking of the next book, and the more I think about it, the more the ideas come. You must try and write something every day, or at least be thinking about writing, working on your current story, developing scenes, etc. My best time for this is when I’m driving to work. And read. I’ve heard people say they haven’t got time for reading. This is nonsense – of course you have! And by this, I mean reading for pleasure. If a book grabs you, think about why. I read such tripe from so-called experts about how to write. I honestly believe it is something which lives inside you, that desire to tell stories, to create worlds and populate them with people who exist, for you, in your mind. The trick is, to make them exist for readers. I don’t think this can be taught, or learnt. You must want to do it, and you must have a fertile imagination. If you have this desire, this need to tell stories, then do it. The more you do it, the better you become. Honestly. I’ve never seriously considered self-publishing. How do you know if you’re good enough? So, I have submitted to agents from almost right at the very start. I’ve been submitting for almost forty years now, but it was in 2009 that I managed to acquire a deal. I’ve made mistakes; there are crooks out there, you really have to be careful. If you are looking to be published by one of the smaller independents – and there are lots out there – check them out first. Predators and Editors is a good site to check up on prospective publishers, and Author-Beware gives invaluable help.Despite this, I got stung by a despicable character when I first set out, but fortunately myself and a few other authors managed to get him removed from publishing and have his name splattered all over P&E. Now I have a couple of publishers who work with me, and have faith in my abilities. Writing is a lonely business and it gives you such a boost when your publisher or agent says, ‘I love what you do!’ I still submit to the larger publishers. It is having that affirmation that what you do is worthy. Friends and family, however well-meaning, are not a good indicator of your talent. Professionals, people who have worked in the business for many years, they are the ones who count. And readers. For me, personally speaking, I won’t accept I have ‘arrived’ until I see one of my books on the shelf at Waterstones. This is my dream. This is very tricky because I don’t think anybody actually knows. When Kindle exploded a few years back, everyone was running around like scalded cats, believing paperbacks were dead and the future was electronic books. Well, this hasn’t happened. People will still buy real books, put them on their shelves, hold them, love them. A book is more than just something you read. It is part of you. Memories. I love what France has done, putting restrictions on Amazon, and empowering bookshops. Bookshops are everywhere in France, and I think that is so brilliant that a government has the interest of its culture and heritage at the very heart of its policies. Books are an important link to your past and I love my books and would not part with them for anything. I have both. electronic and real. A lot of people do, and I get the feeling this is how it will remain. A lot of people talk about what has happened to the music industry, but isn’t it strange how vinyl is making a comeback. And why? Because L.P.s were precious things, we owned them, treasured them. You can’t do that with CDs, even less with downloads. It will be the same with books. As authors, we should always be mindful of this. I’m old-fashioned, but there is nothing wrong in that. The downside to electronic publishing is that it is so easy. Anyone can now ‘write’ a book, and almost everybody believes they can do it because it is so easy. Unfortunately, the plethora of self-published rubbish has done great damage to those of us who write well. It is so difficult now to rise above the dross.More self-published authors are seeking out the services of professionals, be they editors, book cover designers, etc. But, I’m not so sure about any of that. Why pay so much money when you can work with a small, independent press to get these things done for free? A whole industry, driven by Amazon, has grown up to enable self-published writers to succeed. And now we have the so-called ‘hybrid’ author, who has both traditional and self-published books available. They spout off how wonderful it all is on Facebook, blogs, etc, but … I’m very cynical when it comes to all this. I remember back in the 70s and 80s, all those adverts in the press about finding success in having your own business, and they were all the same. Selling cleaning products. I mean … come on! This has tainted my ideas about all of this. I am very suspicious of self-published books and rarely take account of the hundreds of 5-star reviews a book receives. I mean, how is that possible? So, I usually read the 1-star ones, and they are very enlightening. But I am forever frustrated. I’m hopeless at marketing, have never been gregarious or pushy when it comes to promoting myself. I like to think my words do that for me. I’ve tried, believe you me, but I’m quite a private person and I’m shy in social gatherings, etc. That’s just the way I am. That may mean I will forever be at the bottom of the pile, but although that is frustrating, it is not of any huge concern. I would love to be a best-selling author, of course I would, but for me to write well is my true aim. Fame and riches will be things which will never visit me, I don’t believe. If they do, I’ll gladly welcome them in! What genres do you write? : Thrillers, historical fiction, dystopian, paranormal, young adult.